As many learn only after a great deal of lost time and opportunity, business development is a process, not a point-in-time tactic. Applying this process effectively means continually scanning market, customer and competitive landscapes for new opportunities and threats. An ecosystem map helps identify potential partners that can grow your business and strengthen your position against competitors. Understand the whole product your customers buy. As mentioned before, it’s important to know fully where your business fits among the whole product your customers buy. In virtually all software categories, what your customer buys in order to solve their problem is far more than just what you sell. Knowing where you sit among complimentary and competitive products is key to identifying new business development opportunities. The Customer Development methodology, while designed for startups, can also be valuable for established software companies in understanding your customers’ views of whole product. In the case of a typical enterprise application, a host of other products come into play: operating system, database, servers, storage, security, datacenter — the list goes on and on. Don’t be indifferent to these other components of the solution. Make it part of your customer support process to survey and understand the technologies that your customers deploy alongside your product. As you see preferences and patterns emerge, you’ll have the beginning of a target list of potential partners. While the idea of whole product is more pronounced in the case of complex, enterprise systems, even seemingly straight-forward Software-as-a-Service products rarely constitute the whole product. From mobile application providers to cloud-based data integration services, potential ecosystem partners are out there. Even if your focus is SoHo, opportunities exist, from making strategic bets by tightly integrating select, complimentary applications, to building an open API in order to move from stand-alone application to platform. Understand how they discover, select, buy, implement and manage it. From industry analysts, to boutique strategy consulting firms, to specialized systems integrators, understanding who helps your customers reach a buying decision and successfully implement and manage applications in your category is the next step in building your target map. If your product’s price is above the typical mid-level manager’s discretionary spending limit of $10,000, you can bet there are others influencing the buying decision. And if you’re entering an established category with a new product, you can significantly speed legitimacy and trust in the eyes of your customers by establishing relationships with key influencers and implementers. Here again, even far less expensive products have influencers and implementers. The growing field of social CRM applications serves as a good example. Though buying these products is a process measured in minutes, most vendors have established a partner program to attract specialized consulting firms that deliver data migration, training, support and related services. They understand that CRM, as a well established category, has a well established partner ecosystem. Identify who can reach the customers you don’t. To the list of those already delivering on your customers’ whole product, add those who reach customers you don’t and who have gaps in their offerings or competitive weaknesses that you can address. In addition, look for firms for whom the addition of your capabilities could extend their reach into adjacent market or customer segments. These could be service providers whose competitors are outpacing them by embracing technologies similar to yours, or other software vendors that have begun to lose customers or market share because of dated or inferior capabilities in areas core to your product. Without question, these are longer business development cycles that are more difficult to bring to successful closure. However, when they do, they often lead to the most meaningful partnerships, strategically or as measured by revenue. They represent unique opportunities to acquire new customers and even change the dynamics of a market. Map the resulting ecosystem and the primary players in it. 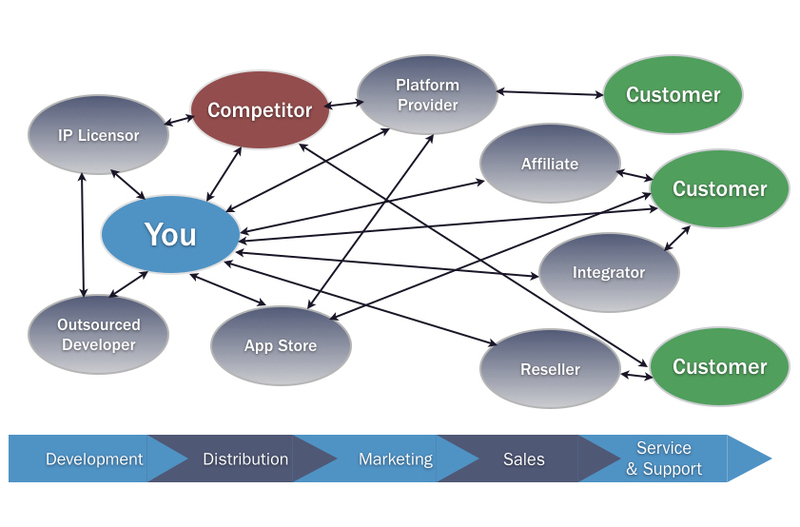 Once you’ve developed a list of complimentary product vendors, influencers, implementers and other potential partners, creating a visual representation of this ecosystem and the relationships within serves as an effective communications and planning tool, and ultimately a target map for your business development efforts. Add up-stream partners and competitors and you have a thorough picture of your ecosystem. Your ecosystem map should be a living document, reviewed and updated regularly, ideally as part of your quarterly business reviews and annual strategic planning cycles. Along with specific strategic and revenue targets, it then becomes an effective scorecard and planning tool for measuring your business development efforts, as well as a means of getting everyone on the same page regarding your position—and the strength or weakness of it—within your ecosystem.